Men like Henry George are rare unfortunately. One cannot imagine a more beautiful combination of intellectual keenness, artistic form, and fervent love of justice. We have taken over the planet as if we owned it, and we call it progress because we think we are making it better, but in fact we are regressing. Species are dying in the wake of this ‘progress’, and we seem not to realise that our life depends on theirs … It is clear to me that unless we connect directly with the Earth, we will not have a clue why we should save it. Once, natural resources were fully used for the benefit of all, and not appropriated for selfish ends. This was the age of the GreatCommonwealth of peace and prosperity. Henry George was one of the real prophets of the world; one of the seers of the world….His was a wonderful mind; he saw a question from every side. The “single tax” is so simple, so fundamental, and so easy to carry into effect that I have no doubt that it will be about the last land reform the world will ever get. People in this world are not often logical. George’s blend of radicalism and conservatism can puzzle one, until it is seen as a reconciliation of the two. The system is internally consistent, but defies conventional stereotypes. No person, I think, ever saw a herd of buffalo, of which a few were fat and the great majority lean. No person ever saw a flock of birds, of which two or three were swimming in grease, and the others all skin and bone. For justice to be done between men it is not necessary for the State to take the land; it is only necessary to take its rent. A tax on land values is of all taxes that which best fulfils every requirement of a perfect tax. As land cannot be hidden or carried off, a tax on land values can be assessed with more certainty and can be collected with greater ease and less expense than any other tax, while it does not in the slightest degree check production or lessen its incentive. It is, in fact, a tax only in form, being in nature a rent – a taking for the use of the community of a value that arises not from individual exertion but from the growth of the community. For it is not anything that the individual owner or user does that gives value to land. The value that he creates is a value that attaches to improvements. This, being the the result of individual exertion, properly belongs to the individual, and cannot be taxed without lessening the incentive to production. But the value that attaches to land itself is a value arising from the growth of the community and increasing with social growth. It therefore properly belongs to the community, and can be taken to the last penny without in the slightest degree lessening the incentive to production. 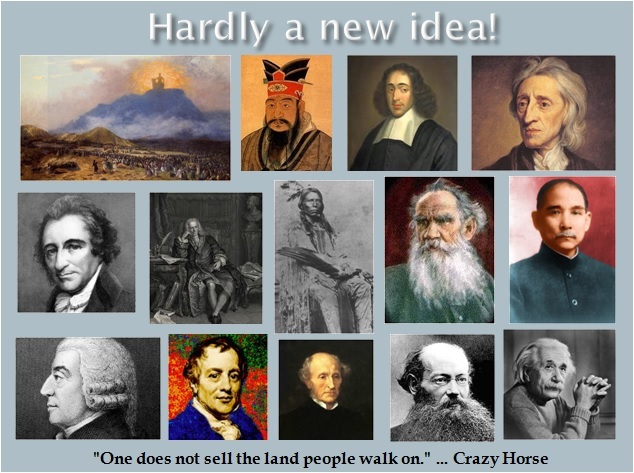 If I were to re-write this book, I would offer a third alternative – the possibility of sanity – Economics would be decentralist and Henry Georgian. The land, the earth that God gave to man for his home, his sustenance and support, should never be the possession of any man, corporation, society or unfriendly government, any more than the air or water – if as much. An individual or enterprise requiring land should hold no more in their own right than is needed for their home and sustenance, and never more than they have in actual use in the prudent management of their legitimate business, and this much should not be permitted when it creates an exclusive monopoly. All that is not so used should be held for the free use of every family to make homesteads, and to hold them so long as they are occupied. A reform like this will be worked out some time in the future. It is in vain in a country whose great fund is land to hope to lay the public charge on anything else; there at last it will terminate. The merchant (do what you can) will not bear it, the laborer cannot, and therefore the landholder must: and whether he were best to do it by laying it directly where it will at last settle, or by letting it come to him by the sinking of his rents, which when they are fallen, everyone knows they are not easily raised again, let him consider. Landlords grow richer in their sleep without working, risking or economizing. The increase in the value of land, arising as it does from the efforts of an entire community, should belong to the community and not to the individual who might hold title. Men did not make the earth…. It is the value of the improvements only, and not the earth itself, that is individual property…. Every proprietor owes to the community a ground rent for the land which he holds. The land tax as the only means of supporting the government is an infinitely just, reasonable, and equitably-distributed tax, and on it we will found our new system. People do not argue with the teachings of George, they simply do not know it…. He who becomes acquainted with it cannot but agree. Of all indispensable alterations of the forms of social life there is in the life of the world one which is most ripe…. The method of solving the land problem has been elaborated by Henry George to a degree of perfection that under the existing state organisation and compulsory taxation, it is impossible to invent any better, more just, practical and peaceful solution. Quite difficult matters can be explained even to a slow-witted man, if only he has not already adopted a wrong opinion about them; but the simplest things cannot be made clear even to a very intelligent man if he is firmly persuaded that he already knows, and knows indubitably, the truth of the matter under consideration. Solving the land question means the solving of all social questions…. Possession of land by people who do not use it is immoral – just like the possession of slaves. The earth cannot be anyone’s property. I sit on a man’s back choking him and making him carry me and assure myself and others that I am sorry for him and wish to lighten his load by all possible means – except by getting off his back. When the missionaries first came, they had the bible and we had the land. Now we have the bible and they have the land. Henry George’s proposition, the single tax, will wait, I fancy, for years, since it is so fundamental, and mankind never attacks fundamental problems until it has exhausted all the superficial ones. “Was a great high wall there that tried to stop me, A sign was painted said: “Private Property”, But on the back side, it didn’t say nothing, That side was made for you and me”. Excellent list, it is obvious that the land question was very much on peoples minds. There are many more to add to the list.